Looking for Slammers this weekend, I found Hershey’s Whoppers Milkshake milk instead and tried it. It really does taste like a malty milkshake only it’s not frozen, just cold. It is SUPER sweet – too sweet really. The 14 oz. bottle of thick milk serves two but who drinks half a bottle? Oh, and you don’t want to know how much fat and calories are in this thing. I also ran across a new Limited Edition candy I had not heard of before so I picked up a box: Chocolate-Covered Sugar Babies. Overall, I wasn’t impressed. The chocolate was waxy and just like the chocolate on Milk Duds. The chocolate slid off almost totally at the first bite and never really mixed with the caramel of the Sugar Babies. 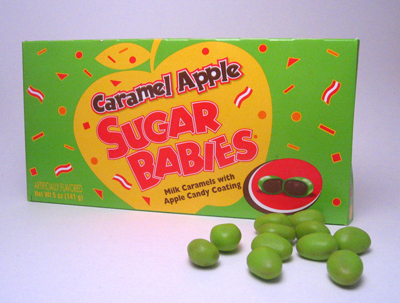 If you like Sugar Babies, stick to the original. I also tried a Milky Way Ice Cream Bar. Oh yeah. Just as good as the Snickers Ice Cream Bar. Fan-freakin’-tastic. I ate a Cadbury Twirl Friday that my wife picked up for me at the World Market. It’s a British chocolate candy that is very smooth and has lots of layers running the length of the roll. It has a bit of an odd taste to it at first but it ended up being pretty good. I recommend it if you like the distinctive taste of Cadbury chocolate. Wrigley’s Extra Watermelon Gum is really good. It has a great watermelon taste and really does last extra long.